Trees that have fallen into water courses will typically act as dams leading to localised flooding, erosion and silt deposition on rivers, streams and other waterways. Tree management, felling and removal of fallen trees is an essential part of water management to ensure that these problems are avoided. 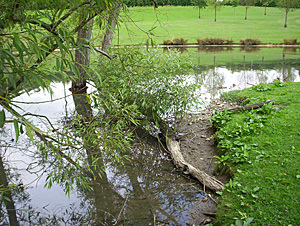 Tree management on lakes and ponds is also a much-neglected part of water management, especially trees growing on islands or that have already toppled into the water. This is often unsightly and speeds up the process of land succeeding the water. A further consideration for owner and managers of lakes and ponds is the contribution of leaf litter, that eventually becomes silt, that is deposited by trees surrounding the water. Trees are an intrinsic part of the landscape but can be responsible for the very quick reclamation of ponds and lakes if not controlled. On most water features, tree management should be an essential part of the management plan. Many tree companies are reluctant to work in the aquatic environment either through inexperience of working in and around water or lacking the equipment required for this very specialised job. With the equipment and skills we have, we are ideally placed to cut and process trees in and around waterways. 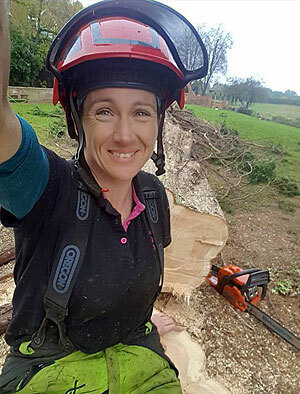 We have a trained and certified tree surgeon who can work at height, as well as heavy duty stable boats that provide a safe working platform whilst working in water.